A Tribute for Don Neuen will be held at 7 p.m. Sunday at the Rose Theater, 14140 All American Way in Westminster. Tickets are $10 a person. Information: Box Office at 714-793-1150, ext. 1. GARDEN GROVE – Several members of the Crystal Cathedral's congregation will independently hold a tribute Sunday night for the megachurch's long-time choral director, Don Neuen, the most recent member to resign after a dispute with founder Robert H. Schuller's children, now in charge of the ministry. 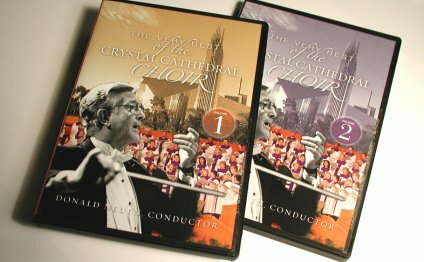 Neuen said he quit last month after 10 years of conducting the renowned Crystal Cathedral choir, which was featured in the "Hour of Power" program broadcast worldwide to millions of viewers. Famed pianist Roger Williams left the church earlier this year, also after a difference of opinion with a Schuller daughter. "These were the best 10 years of my life, " an emotional Neuen said Thursday. But things ended on a sour note for the choir director. He said the "last straw" for him was when Gretchen Schuller Penner, who directs the "Hour of Power" programs, told him that she would be "vetting choir members" going forward and that she would make sure that they were "emotionally and spiritually fit for the Crystal Cathedral." "I found that to be terribly judgmental and couldn't accept it, " Neuen said. Congregation members led by long-time church member Jim McDonald expressed a desire to hold an event at the church for Neuen. But McDonald said their request was declined because "the church could not accommodate it." Also scheduled to attend the event are Robert A. Schuller, who left the church two years ago over a dispute with his father, sisters and brothers-in-law, his wife Donna Schuller, their son, Robert V. Schuller, who has his own ministry in Orange, and his wife, Hannah Schuller. Pastor Jim Point, who was laid off immediately after the younger Schuller's departure, will also come from Arizona for this event, McDonald said. Robert A. Schuller joined hands with his son-in-law Chris Wyatt to formulate family-friendly programming at the American Life Network based in Dallas. Schuller's show "Everyday Life" about the role of spirituality in everyday life premiered last Thanksgiving. "Don Neuen was brought in by Bob and Arvella Schuller to create for the 'Hour of Power' the best orchestra and choir, " he said. Several members of the congregation, who will be attending Sunday's event, expressed disappointment over the Cathedral's refusal to allow the event to take place on campus and the general direction in which the megachurch is headed. The Cathedral is faced with a $55 million debt because of the economy and dwindling contributions. In May, the church sold land donated by John and Donna Crean in San Juan Capistrano, which was expected to clear about 22 percent of their debt. The Cathedral also owes millions to several creditors including musicians, choir members, an equipment financing company, television stations and other vendors who provided services for the "Glory of Christmas" pageant. "I used to attend services when this place was an old drive-in theater, " he said. "The message was so strong and so positive that I always left with a tear in my eye. I'll just say that hasn't happened in a long time." LaBonte said he even wrote a letter to Sheila Schuller Coleman asking questions about family members' salaries and other financial matters, but received no answers. "I understand that this is a business, but it's also a church and it's run with our money and money from others who contribute, " he said. "But there has not been transparency." Shirley Zink, a 37-year member who is still a greeter at the Cathedral, says what the megachurch needs is a "dynamic pastor." Zink said she feels it is necessary to thank Neuen and others who helped create a "wonderful, spiritual atmosphere'' at the services. "We need to thank them for their service, " she said. "There was no compassionate communication on the part of the cathedral to these people who had been suffering without being able to pay rent or even pay for food, " he said.